03 | February | 2019 | H.A.W.K.S. As I mentioned in the previous post, the HAWKs started the year’s Ghost Archipelago campaign on the 26th of January. There are at least nine of us participating, although we don’t get everyone most months. We agreed to restart this year with new crews, so I decided to go all in, and paint an entirely new crew. 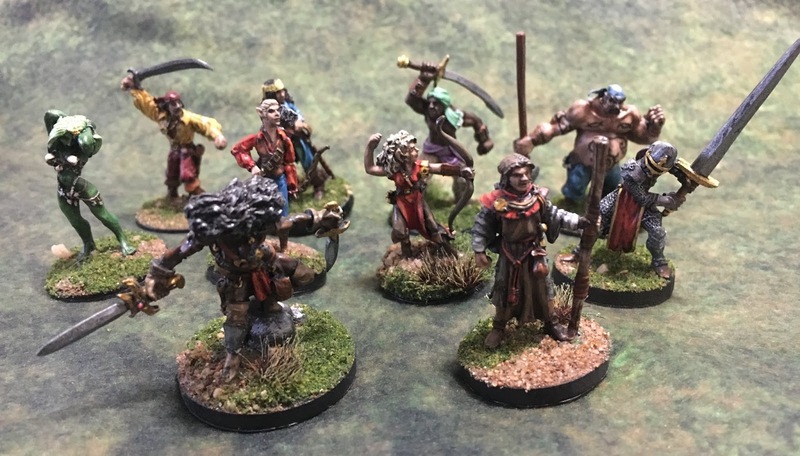 This group is all figures from Reaper miniatures, although enough different sculptors are involved that they don’t have a particularly consistent look to them. I found myself doing a little red and yellow motif on most of the specialists, although the crew is fairly motley. 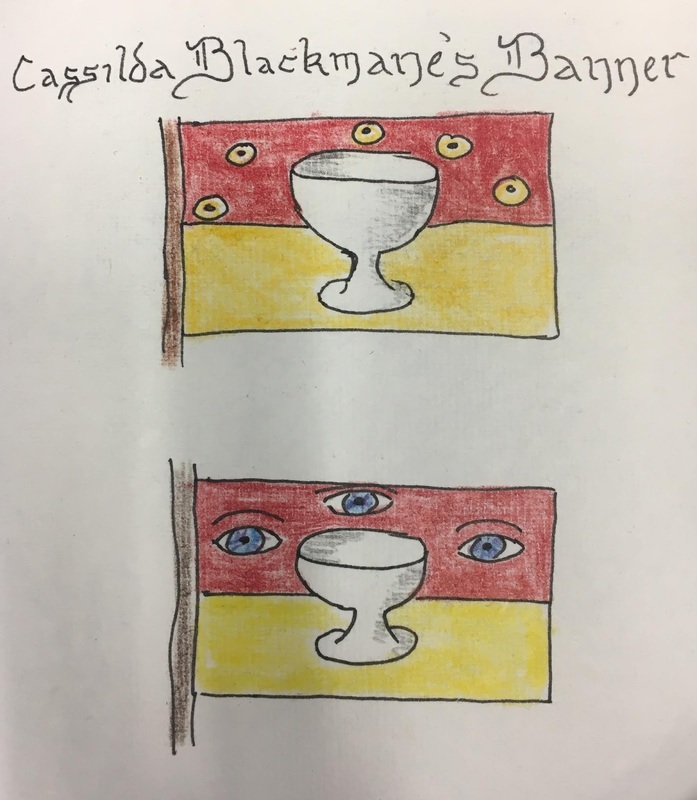 I’ve been doodling ideas for a banner, so I went with the red and yellow there too. I have a banner bearer converted, but I haven’t started painting her yet. 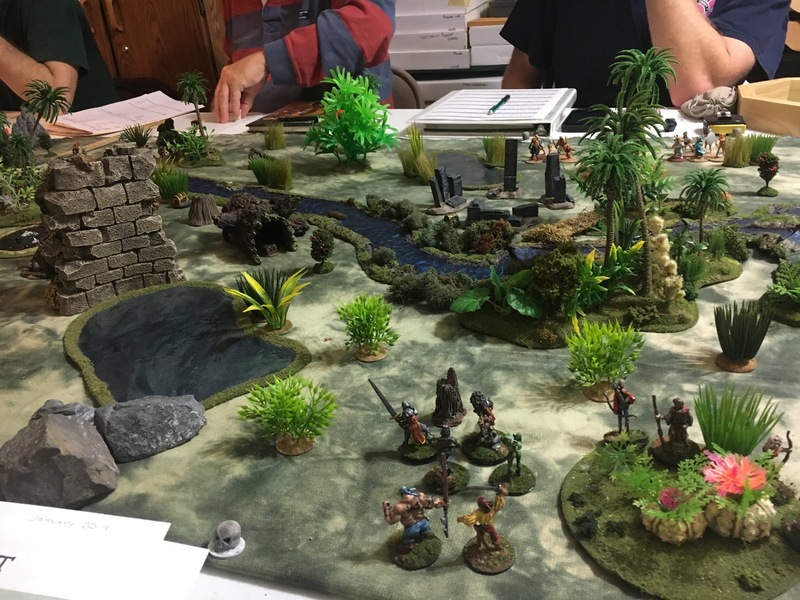 We made landfall on a small island, hoping to find a clue to the location of the fabled Crystal Pool, or at least a few treasures to make the search easier. To my dismay, no fewer than seven other ships were seen approaching the island as well. I chose, therefore, to lead the landing party, taking along Quartz (my Earth Warden), and the mercenary trio Oak, Ash, and Thorn. Spying a stream in the distance, I led Oak and a few crewmen to the left, toward a thicket, where we found a concealed chest. Quartz and the archers went to investigate the curious stone head. 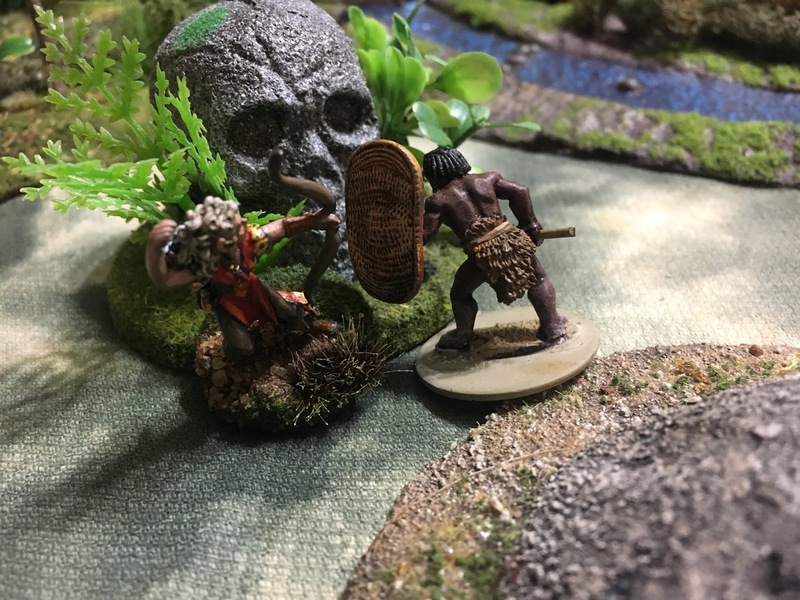 As we approached the thicket and secured the treasure, a Heritor, whose name we later learned was Safar, appeared across the stream and loosed a volley of arrows. One hit me, causing a serious wound, and we backed away, not, however, before we secured the treasure. 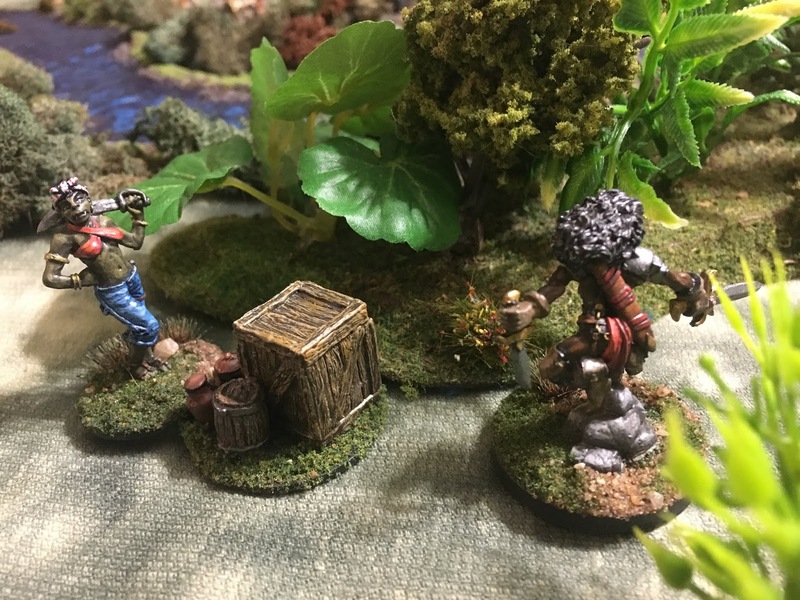 Oak and the crewman Surecast found another in a hollow fallen tree at the edge of a deep pond. 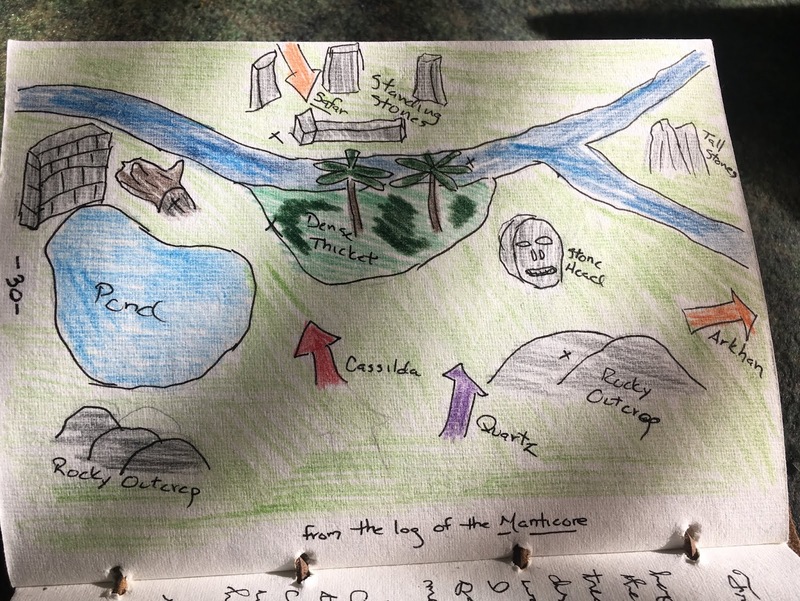 For some reason Safar and his crew retreated hastily [ed., a beast attack distracted them], so that Oak and Surecast had no problem securing the treasure from the tree. Quartz and the archers Ash and Thorn exchanged arrows briefly with Safar’s crew, but were then set upon by a few crewmen from the ship of a Heritor called Arkhan. These appeared mostly to be natives of the Archipelago, and they fought with skill and ferocity. Thorn was sorely wounded, and I went to her aid. As best I recall, I must have partially parried a blow from the tribesman’s weapon and then been knocked out by a glancing blow. Quartz informed me after than Thorn dragged me from the field, although both of her companions, Ash and Oak, were slain. It was definitely a rough game from the player perspective. Arkhan’s crewmen proved to be more than a match for my specialists, and knocked out my Heritor as well. I collected three basic treasures, but didn’t get near a central treasure. Oak, a 100 gold piece Mercenary, was permanently slain by a goat that had wandered onto the field, and Ash, an archer, by one of the crewmen. Next game, I will be swapping in two freshly painted crewmen; I have a few more before I have to recycle any of the dead figures.